I am not prone to obsession. In general, I can’t stand reruns. I’ve seen very few films twice. If you ask about my favorite book, the answer will change every time. I’m disinclined to favoritism, to fixation and repetition. This is why it interested me when, a few years ago, a friend asked what piece of literature I return to again and again in times of need, joy, or sadness—what story is my Bible—and my answer was Final Fantasy X. Many people don’t care for FFX. The first of the series released on the PS2, they said it abandoned story in favor of graphics. They deplored the voice acting. They disdained the jockish protagonist. I agree with some of these criticisms—that laughing-on-the-cliff scene is truly cringe-worthy, and Tidus isn’t the deepest of heroes. Yet something about this game hit me, at age 15, just right. Right enough that 15 years later, I’m still inclined to write about it. What struck me was Yuna. Something in me sat up and perked its ears when she first staggered out of the Chamber of the Fayth, exhausted but triumphant, affirming, “I have become a Summoner,” then collapsing, totally spent. Something in me noticed. Something in me related. Like me at 15, Yuna was soft-spoken, polite, even pliant at first glance. But also like me, she contained determination. She had set out to do something she intended to see through. Around 15 I developed two things: a savior complex and a sense of workaholism. I wanted to save everyone. I regularly pulled all-nighters, pleading with friends who had expressed suicidal ideation in five or more IM windows. A boy in my grade latched onto me. Followed me in halls. Transferred into all my classes. Showed up in my yard at night, begging me to listen. I didn’t mind. I wanted to help. The situation worsened. In the meantime I delved into school, reveling in the fact that I’d been labeled a “good student,” seeing this as a path to some vague, uncharted glory. I added extra courses, getting special permission. I wore dark circles like medals under each eye. Self-sacrifice and resolve: these were the things that drew me to Yuna, things I was seeking to cultivate in myself. I was determined to suffer, nobly, striving for goodness and greatness. I would suffer, yes. But I would endure. Over the years I relinquished something of the self-sacrifice, losing all patience with people who asked to be saved, and realizing, too, the arrogance of saviors. This image, though, of the exhausted, triumphant woman, relentlessly carving out her quest—this stayed with me, even as years passed since I’d played the game itself. In 2014 I began my dissertation in English, the most difficult thing I’ve undertaken. After breezing through coursework and clearing the hurdle of qualifying exams with immense but short-lived effort, the dissertation hit me like a sack full of iron. Trying to make work feel less like work, I developed a playlist of instrumental, epic music—including, of course, tracks from FFX. This got me over the coals of the prospectus, even as I self-consciously joked about it to friends, but progress slowed again in the spring of last year. After failing to write one word for four months, I decided I had to make the dissertation a game. I had to treat myself like a child—develop a system of rewards. 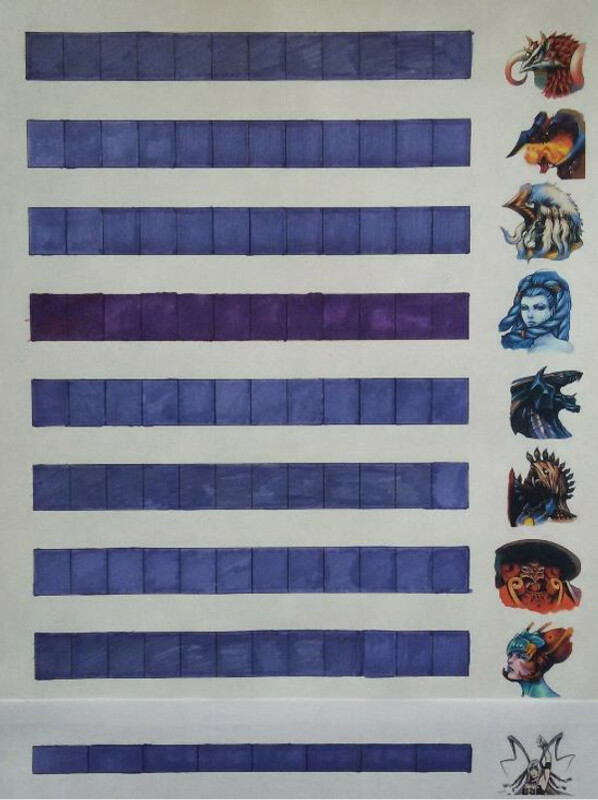 The method came to me in a flash: eight proposed chapters, eight Aeons in FFX. The idea of a pilgrimage. My old, dusty idol. Once again, even laughing as I did it, I came up with a system of progress inspired by FFX. I had to try something. This was a start. I shaded a block for every two pages written, turning the isolation and drudgery of writing into a private quest. It seemed silly, but it built momentum. It felt fun. It actually worked. Remembering the thrill of visiting each temple, recalling the excitement of gaining each Aeon’s power, I increasingly found this a fitting metaphor for my chapters. After all, Yuna doesn’t defeat the Aeons; she convinces them of her worth. She coaxes trust until it is gained and the two can work together. That is the kind of metaphor I wanted for this process—one of proving, of earning, of partnership. What started as a flailing joke began to take on meaning. In the end, the system proved so effective that I added a bar for Yunalesca to represent the more mechanical aspects of completion, things I felt I had to “overcome” rather than collaborate with—the formatting, the table of contents, the forms and forms and forms. 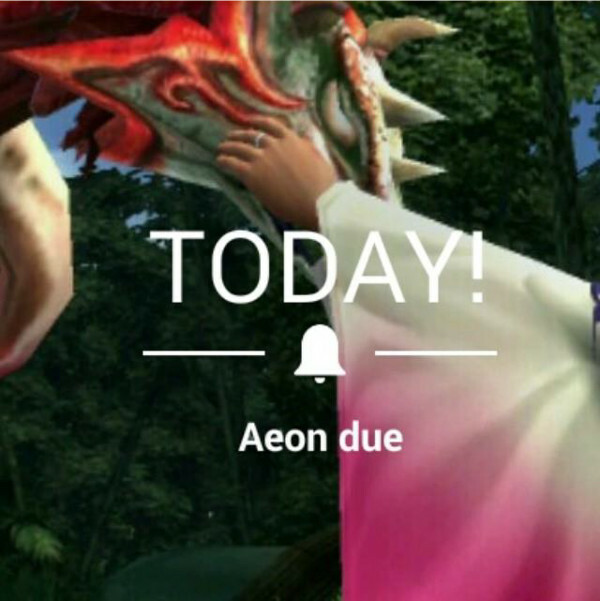 Gearing up for my defense, I thought of Yu Yevon—the last, final boss. In giving advice to fellow students beginning their dissertations, I recently recommended taking up some version of the chart. To choose a metaphor that feels meaningful to them. 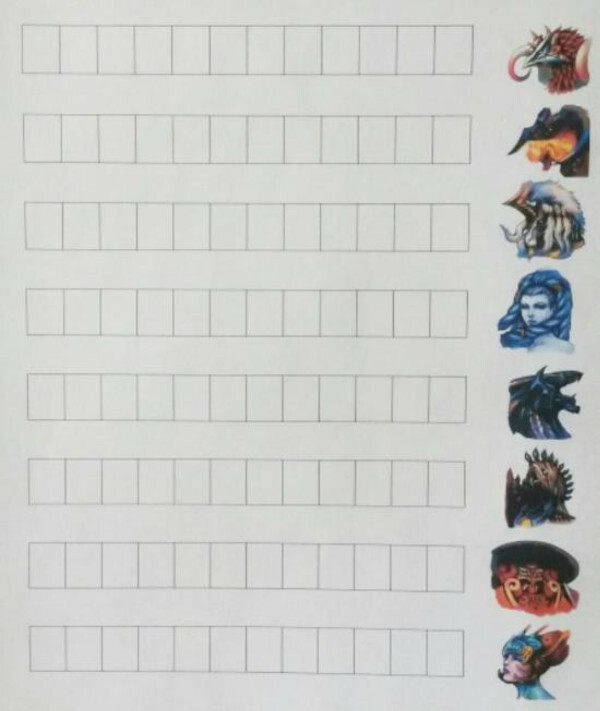 As I verbalized this for the first time, however, elaborating on practices I’d found that worked for me, I realized FFX had crept into my life in more ways than one. I’d bought myself a hoodie with its logo on the back. I wore it every time I sat down to the growing document. I’d listened to my playlist so many times, I’d conditioned myself, Pavlovian: I cannot hear the first song now without equating it with work. Embodying this narrative became a ritual, steady as the Hymn of the Fayth. Maybe it takes this kind of fixation, of religiosity to complete this. Maybe this single-minded focus is exactly what I needed. A talisman. A rosary to thumb. Whatever the reason, I figured, it helped. “Becoming a Summoner” helped. Even though there are games I like better than X, this, for some reason, worked. Near the end of the dissertation I returned to my father’s house and dug out an old box. I was looking for an old drawing. I found it, and something else. This was not the drawing I was looking for. But this is what I found. Something I’d completely forgotten I’d made, something I’d drawn in the grip of what I used to call an “Art Tantrum” when I was 23. I drew it on the inside of a box lid while working a retail job I despised. I drew it without drafting, simply stabbing at the cardboard in marker. I drew it as it came to me, on instinct, without question. There’s a lot going on in this picture. The three figures are self-portraits—at 15, at 21, and on the right, at 23. 23 was a confusing year, one spent locked in an engagement that was not to become a marriage. One spent faint as pencil. The middle is a year when I felt uniquely free—the magenta hair and grass-stained sweater are accurate representations. 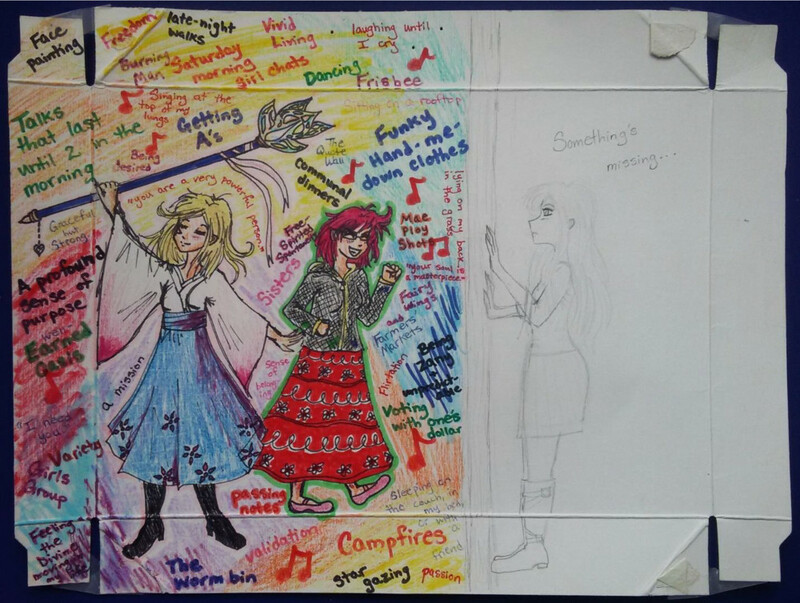 The left, though shakily drawn, having no image for reference, is clear: my 15-year-old self as Yuna. Why I made this portrait symbolic while the others are literal, I can’t say. I only know it felt right at the time and that it stirred something in me when I found it last winter, lifting it out of the box. The gist of the image, of course, is the disparity between the goodness I felt at 15 and 21 and the emptiness I felt at 23. While melodramatic, it was affirming—proof of the emotions that drove decisions I later made. In particular, though, what interests me now are the words surrounding my Yuna-self. A profound sense of purpose. Graceful but strong. Well-earned oasis. A mission. It was these qualities that drew me to Yuna as much as any measure of self-sacrifice. The first time I played the game, would you believe I was a little disappointed that she didn’t die? That she defies the myth of Spira and lives, upending her tragic fate? Enraptured by the image of a self-destructing woman, a part of me felt cheated, even as other parts rejoiced. Regardless, what shone through then and kept my interest piqued was her resolve, her sense of purpose. The antithesis of sloth, she would not rest until her task was finished. Admiration and desire for this quality are what carried my feet to grad school, whether I realized it or not. Yuna was there all along, though she’d seemed like a relic who’d emerged at the dissertation stage: a last-minute, real-world power-up. The box lid in my hands gleamed like a dot, connecting me to past, more recent past, and present. A continuous thread in my life, the constellation of an arrow ushering me forward. And in fact, this continuity is more pervasive than I realized even then. In 2011, after learning about literature’s historical propensity for funneling female characters into compulsory weddings or death, I presented a conference paper on contemporary media that do not succumb to this trend. It included FFX—for many reasons, but most of all for the scene where Yuna appears trapped between toxic matrimony and suicide, but finds escape from both. A scene that was instrumental as I contemplated options during my own, similar escape. That enabled me to live and to find a healthy love. 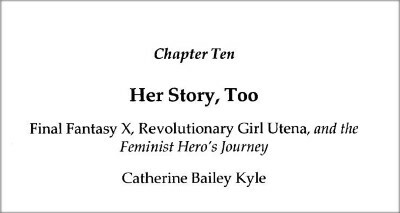 In 2014, that essay was published as part of an anthology on modern female heroes. I knew this. I knew. Yet I still laughed self-consciously when printing my Aeon chart. I am not prone to obsession, but I cannot deny this thread, this vein that sings like Fayth. There is something to this—a touchstone, a guidepost. A reminder of one’s soul, yet also a reminder that one’s soul is mercurial, fluid rather than fixed. Yuna, for me, has been a palimpsest—a character on whom I’ve written again and again, turning her, prism-like, spilling light through her various faces. Self-abnegating martyr. Determined introvert. Marriage resister. And yet, love-seeker. When my friend asked of my secular Bible and I answered FFX, it leapt to mind because it is one of the only games I have actually played more than once. Each time, I see now, I was observing new things, relating in new ways. Sometimes projecting parallels of triumph, other times of survival. Perhaps what caught me so off guard about the effectiveness of the Aeon chart is the admission it necessitates: that though Yuna comes from a game with awkwardness aplenty, she comes too from a myth that infuses my actions, a narrative wound around me. She is something that sings throughout my life, resounding through temple and journey.